The demonstrations and attacks in the Middle-East targeted the wrong people, judging the fact that the American government considered the movie to be disgusting and didn’t take part in its making. It’s basically like Nigerians attacking the American consulate because some racist man made a racist film. The embassy clashes throughout the Muslim world gave the image the film wanted for the protesters to have. The attack on KFC was an act of stupidity too: The restaurant hires them, pays them, feeds them, and gives them jobs they are begging to have in a country where unemployment is the norm. It’s like harming yourself and a restaurant that has no link with the movie. And the best part is that they actually gave a bad quality movie a publicity he was dreaming to enjoy. One more comment: The upload of the movie “Innocence Of Muslims” was made on Youtube on the first of July. Why are we having the attacks and demonstrations now? Why not earlier? 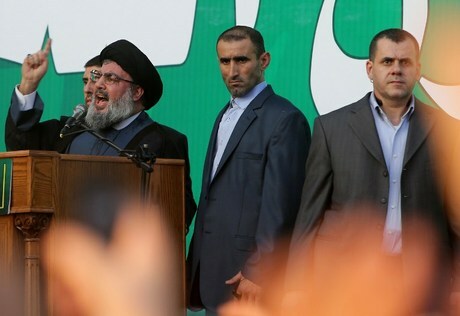 But from all the hustle and bustle, one should focus on Nasrallah’s live appearance. Last time he was seen live – he rarely goes public – was back in December. And the timing of his appearance isn’t randomly chosen. The Sectarian Umbrella. Nasrallah wants to show that he too can bring the crowds to the street. If the Pope can bring 350000 men, se can he. It’s a perfect timing to show that he isn’t only a political and military leader, he’s a religious one too. He isn’t only related to political and military events, but to the religious one too. The crowds want more of him than speaking on religious occasions. They want to see him argue religiously and defend on a religious basis. Today, he gave them what they wanted, it seemed like he was the defender of the faith. The Mikdad Clan Events. They showed that Hezbollah wasn’t in total control of the situation, and gave a feeling that its influence among the Shia families and Clans was getting weaker. His live appearance along with the big demonstrations comes to prove the contrary. The Electoral Count. The elections are approaching, and the demonstration was perfect enough to assess the size of the Hezbollah supporters. Nasrallah’s live presence also gives some enthusiam for what appears to be some kind of a very early electoral rally. Posted in Hassan Nasrallah, Hezbollah, Lebanese Politics, Politics on September 17, 2012 by Ramez Dagher. ← Waiting for the Electoral Law-Are We Waiting For Godot?